W.U.S. Health Centre (Main Campus) is located in the North Campus of University of Delhi. It provides basic and specialized medical facilities to its members/beneficiaries round the clock except on Gazetted Holiday and Sunday from 10:30 AM to 08:00 PM. It has full time Physician, ENT Specialist, Gynaecologist, Pulmonologist, General Duty Medical Officers, Physiotherapist and Part-time visiting Cardiologist, Neurologist, Eye Specialist, Orthopaedician, Psychiatrist, Paediatrician/Child Specialist, Dental Surgeon, Part-time Medical Officers and Optometrist. W.U.S. 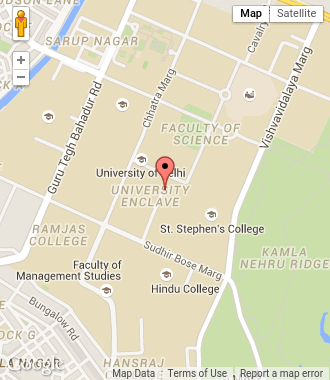 Health Centre's branches are in South Campus, East Delhi (Dr. B.R. Ambedkar College) and West Delhi (Shivaji College). It provides routine Pathology Laboratory Facilities to the beneficiaries 5 days a week. W.U.S. Health Centre (South Campus) provides basic and limited specialized medical facilities from 09:00 AM to 05:30 PM on all working days. It has full time Paediatrician, General Duty Medical Officers and Part-time visiting Eye Specialist, Gynaecologist, Part-time Medical Officers, Dental Surgeon and Physiotherapist. It provides routine Pathology Laboratory Facilities to the beneficiaries 5 days a week. W.U.S. Health Centre (East Delhi) and W.U.S. Health Centre (West Delhi) have single Medical Officers and provide basic medical facilities from Monday to Friday from 09:00 AM to 03:00 PM. It provides skeletal routine Pathology Laboratory Facilities to the beneficiaries. World Health Day: "Depression : Let's Talk"
List of Diagnostic Centers empanelled with University of Delhi under "Reimbursement Facility"